Having recently drawn a few skycharts (Superclusters & Voids, Sanctuary Project), I was frustrated by the lack of parsable resources for the IAU Constellations. Finding a plain-text parsable definition of the asterisms proved impossible. So I created my own. 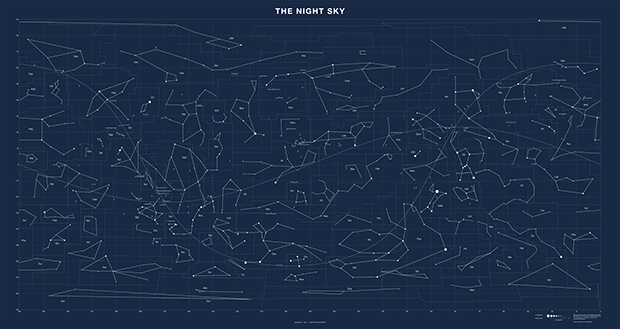 All the constellation shapes were derived by manually examining the IAU map and cross-referencing the stars to the Yale Catalogue of Bright Stars. The list of IAU constellation shapes in the file linked to above conveniently includes the J2000 right ascention and declination for each stars in the pair, along with their HR index, magnitude, Greek letter designation and name. See the file header for all the details. For example, Cassiopeia's familiar "W" appears as 4 lines that indicate the connections between HR stars 21-168-264-403-542. The names are obtained from IAU Catalog of Star Names (IAU-CSN) and Simbad's name fields "NAME", "*" and "**", in that order. You can conveniently browse the Simbad database by any star identifier. For example, for Sirius the URL is http://simbad.u-strasbg.fr/simbad/sim-id?Ident=sirius. 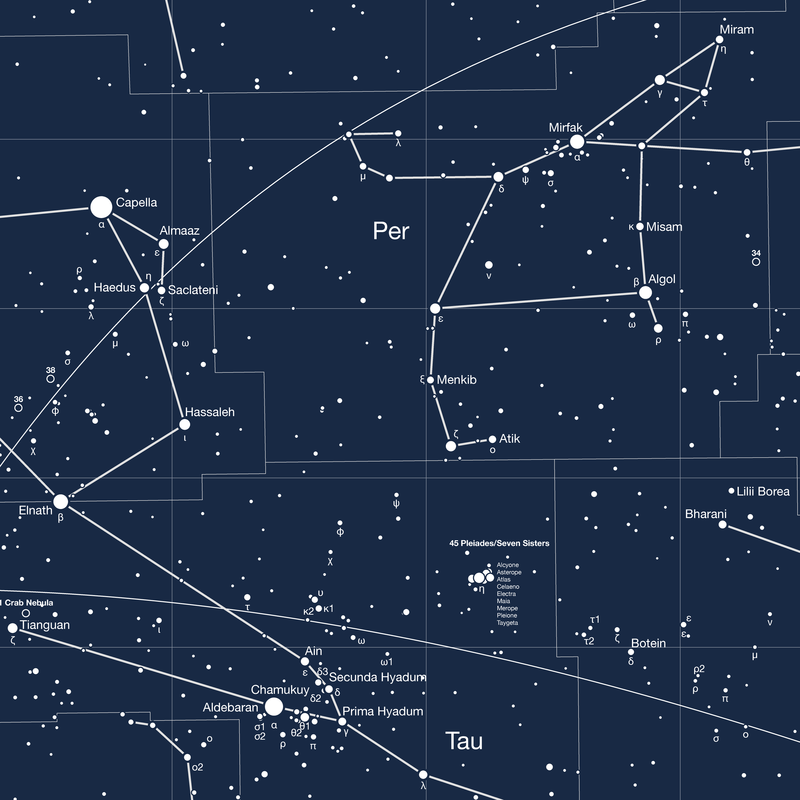 The shapes of all the constellations and the stars that define the asterisms shown in the image below. 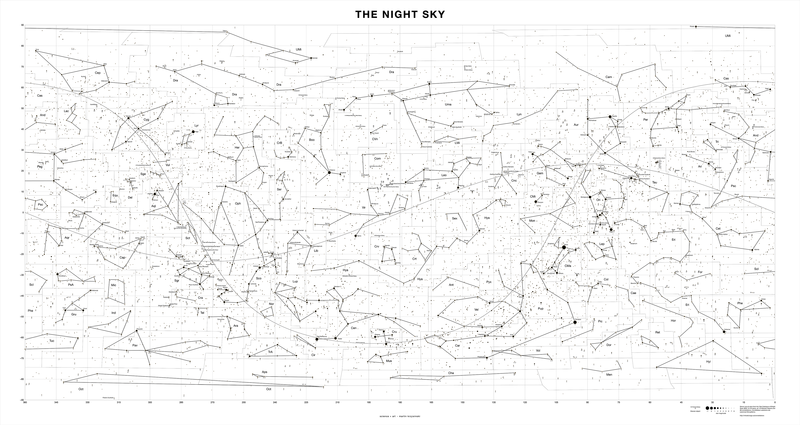 I also include all the 110 Messier objects with common names in this map (hollow circles). The map also shows the galactic equator and the ecliptic. The vernal equinox, summer solstice, autumn equinox and winter solstice occur along the ecliptic at right ascension 0/360 (Pices), 270 (Sagittarius), 180 (Vigo) and 90 (Gemini/Taurus). Whole-sky star charts are traditionally drawn with 360 right ascention on the left in decreasing order towards 0 on the right. 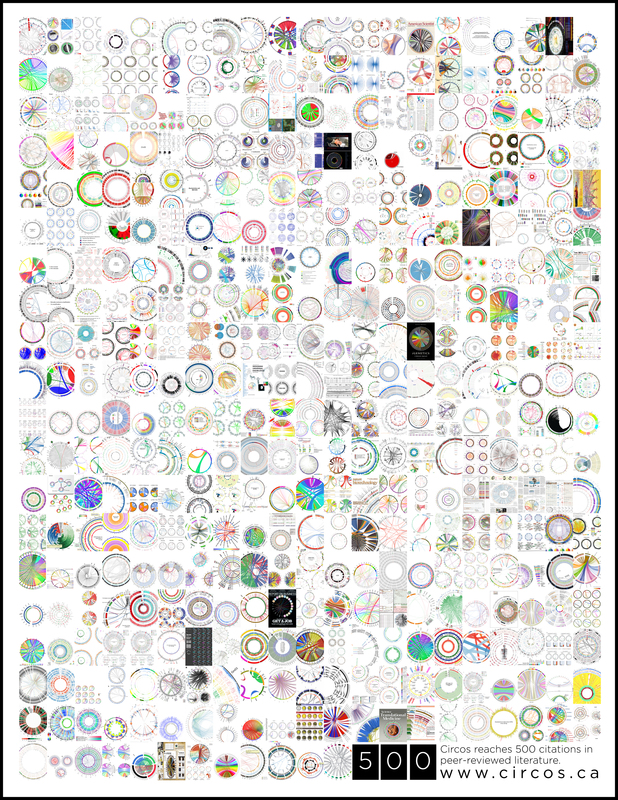 ▲ All 88 IAU constellations and their stars. Also included are all 110 Messier objects. You can download this file as PNG, SVG or PDF. If you're interested in more astronomical resources, check out my Universe Superclusters and Voids resource page. I've also created detailed charts that include all the 9,110 stars in the Yale Catalogue of Bright Stars. These are labeled by their Greek designation with the constellation as well as with their IAU name. 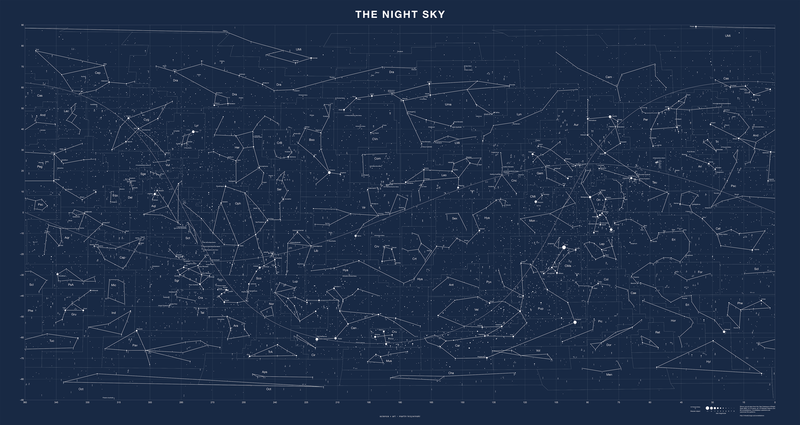 ▲ A closeup of the detailed map in the region of Auriga and Perseus. The Pleiades can be seen at the bottom right. 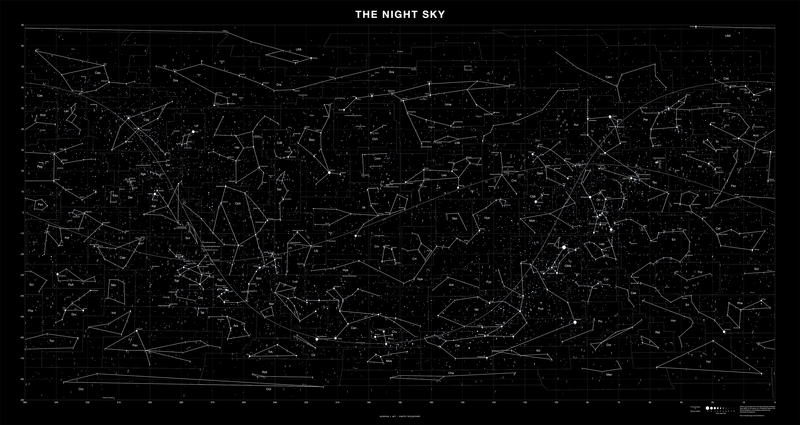 The maps also show all 110 Messier objects, labeled by their index and, where available, a common name. All the labels in these maps have been lovingly adjusted manually to avoid ambiguity and overlap. Available are blue, black and white background versions.